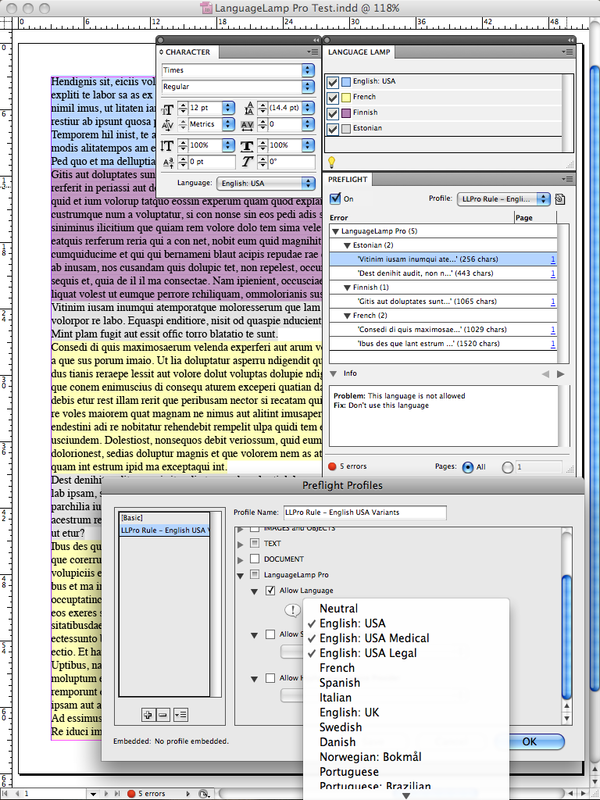 LanguageLamp Pro is an extremely useful utility for working with multiple languages in InDesign documents. It currently supports InDesign Creative Suite (CS3-CS6) and Creative Cloud (CC-CC 2019). LanguageLamp Pro provides all the features of LanguageLamp, plus adds Preflight rules to define which languages are allowed in your document. Take advantage of Live Preflight and eliminate unnecessary errors in spelling and hyphenation. Ensure that the correct language is applied to text in your InDesign documents. Also verify that you are using the correct spelling and hyphenation services for your document by defining the Spelling and Hyphenation Preflight rules in LanguageLamp Pro.